This issue seems to be aimed at the specialist rather than the general listener. We know that Bach created a Passion based on the Gospel according to St Mark, and that it was first performed in Leipzig on Good Friday in 1731, and a revised version (with two added arias) was performed there thirteen years later. 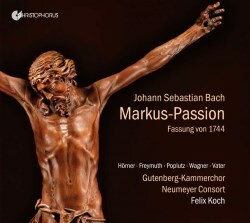 It is generally agreed that Bach recycled earlier works for use in this Passion, most notably the Funeral Ode Lass, Fürstin, lass noch einen Strahl, BWV 198, and that it is thus a parody work. We know that its text (like the St Matthew Passion) was compiled by the poet Christian Friedrich Henrici who used the pseudonym Picander, and we know that because the text has survived, having been published in a poetry anthology in 1732. We know that the work is chorale-heavy compared to its two renowned siblings, and although the melodies for these chorales were identified in the text, the harmonisations Bach favoured were not. The music Bach presumably supplied for the recitatives, and for the turba choruses (the crowd scenes) has not survived, and virtually everything else related to this mysterious score has been the subject of musicological speculation for decades, if not centuries. Given that many completions have been attempted, and some subsequently recorded, this rather austere production from Christophorus seems to be much less reliant on speculation than its competitors, and can thus reasonably claim to contain music that is exclusively Bach’s own. Moreover, in stylistic terms this rather restrained interpretation suits well Picander’s text, which is considerably less florid and dramatic than that the poet provided for its more illustrious predecessor. The problem is that all the recitative parts and turba choruses are narrated (rather drily, by Wolfgang Vater), which might render the text immediately accessible but also hinders the musical flow (at least it does for this reviewer). To boil this down to pure data (anticipating the accusation of knowing the quantity of everything and the value of nothing…. ), this performance contains the two framing choruses, each of five minutes duration; 16 brief chorales, several of which listeners will be familiar to listeners, which last a total of fifteen minutes; 8 arias, several of which are serenely beautiful and carry most of the musical weight in this reading, totalling 34 minutes, leaving basically 25 minutes of spoken content. Karl Böhmer is the musicologist responsible for this edition and he provides a lengthy and eloquent justification of his creative decisions in the booklet. Worthy and sincere though this undoubtedly is, I don’t really think it is aimed at the general listener, more perhaps at the earnest specialist who may be a little wearied by the speculative (if more musical?) completions by luminaries such as Simon Heighes (twice recorded), Ton Koopman, Jordi Savall (his version was broadcast earlier this year on BBC Radio 3) and many others. Either way, the two framing choruses plus three of the arias included in the present recording are (as is the convention) drawn from BWV 198; in terms of both metre and mood they fit Picander’s texts like a glove, as indeed does the other staple, the aria Falsche Welt, dein schmeichelnd Küssen, whose music originally graced the cantata for alto, Widerstehe doch der Sünde, BWV 54. Furthermore, Böhmer has also made use of one aria from the Cantata, BWV 159 as well as three from the A major Mass, BWV 234. As I have intimated, his justifications are a tad technical, but he certainly concedes the speculative (and subjective) nature of the inclusion of these arias by admitting that the term ‘reconstruction’ is barely appropriate at all here. So, putting my reservations about the narrated text to one side, how does the hour or so of Bach’s music that remains sound on this issue? The recording is pleasingly clear and immediate, in a church acoustic which isn’t over-reverberant. The Gutenberg-Kammerchor are excellent – they have clearly been carefully prepared; in the chorales, they are consistently responsive to the text, rhythmically crisp and flexible in terms of dynamics. The open and closing choruses are fervent without being overblown. Christophorus’ clear recording allows the choral sound to blend most naturally with the superb Neumeyer Consort, whose flutes and oboes sound especially lovely. Parody arias or not, they are all prime Bach and, as far as I’m concerned, the three drawn from BWV 198 (namely Mein Heiland, Dich vergress ich nicht and Er kommt, er kommt, er ist verhanden! (both from the first part) and Mein Tröster ist nicht mehr bei mir which opens the second). and the simply glorious Falsche Welt are the highlights of this Passion. The latter two are sung by Georg Poplutz. He has an airy, almost lyric tenor voice. It’s not the most distinctive sound, but his restrained delivery of these two glorious arias fits perfectly into the spirit of this performance. The accompaniment for Falsche welt, with the brisk tread of the cello and bass and an almost banjo-like lute, sounds wonderful. The male alto Julien Freymuth invests Mein Heiland Dich vergress ich nicht with a similar level of cool objectivity which again fits nicely. To be fair, all four soloists offer poised, clean accounts of the arias, while Karl Böhmer’s choices in terms of the extra numbers certainly chime neatly with the rest of the work. As Stephen Johnson argued in an illuminating edition of Radio 3’s ‘Discovering Music’ devoted to the work a few years back, Mark’s version of the Gospel is starker and much less dramatic than Matthew’s, to the point where the narrative almost approaches reportage. It would therefore be completely unrealistic to imagine that this Passion would have surpassed its predecessor in terms of bells and whistles. Perhaps, in the parlance of the old NME, this would have been Bach’s ‘Difficult Third Passion’. And as such, in terms of the music (and Wolfgang Vater’s delivery of the text), Bohmer’s rather scientific approach gets as close to the spirit of this mysterious work as could reasonably be expected. I certainly enjoyed the accounts of the music that is here. But as I suggested earlier, I suspect this worthy issue from Christophorus is probably one for the specialists.